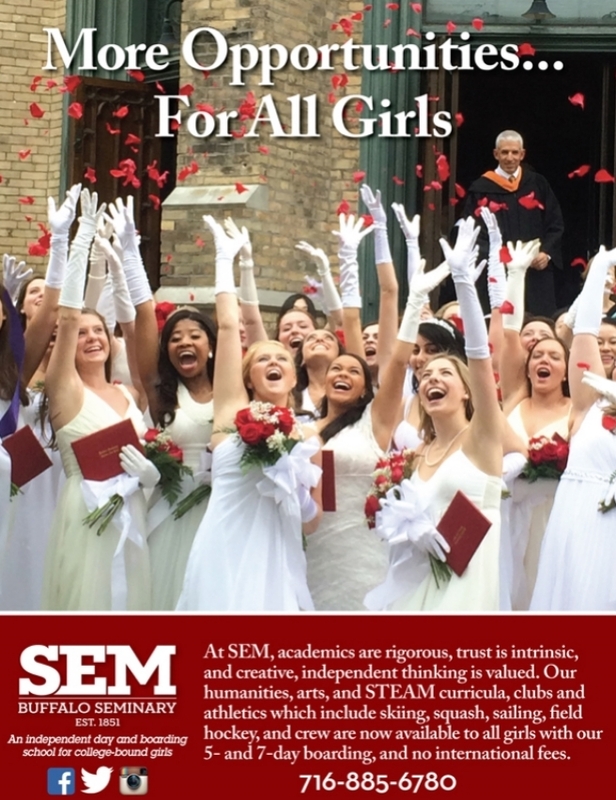 SEM is a perfect choice for Canadian girls who want more from their educational experience than they are having at home. SEM's historic urban campus, tucked away on a parkway in the bustling Elmwood Village neighborhood, puts students steps away from shops, cafes, art galleries, notable architecture, parks, and Larkin Field - our home for soccer, lacrosse, and field hockey. Our intimate size makes much possible, beginning with an average class size of 12, which means no girl goes unnoticed. Seated at Harkness tables for humanities classes, all girls contribute meaningfully to discussions. for humanities classes, all girls contribute meaningfully to discussions. Our innovative freshman "STEAM Experience" (science, technology, engineering, art & design, mathematics) curriculum sets girls on a path to advanced study and work in the STEAM professions. Comprising "Explore Coding," "Explore Engineering," and "Explore and Make It" in trimesters, girls can uncover or deepen interest in these fields. Our "Research and Information Literacy" class for sophomores ensures superior academic skills for high school and college. The senior elective class, "Scientist for Life," inspires girls choose science, and to be aware of the many places scientific thinking can be applied. SEM's individualized college counseling with dozens of annual visits from college representatives, and philosophy of "finding the best fit," ensures that girls have excellent choices of where to pursue their post-secondary education whether in the U.S., Canada, or abroad. SEM 5-day boarding is an ideal choice for Ontarian girls and their families who frequent the Buffalo-Niagara region to shop or ski on the weekends. Girls can spend their week at school with full access to all SEM has to offer - the clubs, teams, extra-curriculars like the school play, musical performances, and community service - but then be picked-up to enjoy family life on the weekend. Students live with faculty members in four renovated historic homes next door to the school building. For more information on the residential program visit this page where a virtual house tour is given by a 7-day boarder and a 5-day boarder. Unlike many American educational institutions, SEM does not charge Canadians international student fees. Also, unlike many girls' schools on either side of the border, SEM is nonsectarian and requires no uniform. SEM can be seen on the Canadian private school source OurKids.net.